Let's be honest here - the US economy is under siege right now. Over 2 1/2 years since the "Great Recession" got underway in December of 2007, things haven't improved at all. In fact, things seem to be getting worse, not better. Many people (not just Americans, but people from all around the world) are extremely worried about the current state of the global economy. In particular, people are worried about the value of their currency and the possibility of high inflation. After all, when governments print money, inflation is usually close behind. 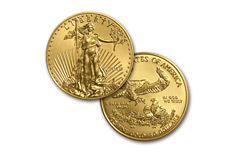 Many people are currently looking to protect their net worths via the purchase of commodities such as gold and silver. One of the most popular methods of acquiring gold is through the purchase of gold coins. The benefit of purchasing gold coins is that you are easily able to buy coins that contain less than an ounce of gold (for instance, you might want to purchase a coin with 1/10th of an ounce of gold). Many people are currently purchasing gold coins, but where is a good (and reputable) place to buy them? One of the best places that I have found is called APMEX (American Precious Metals Exchange). When you are buying gold coins, especially online, you need to buy from a place that you can trust. APMEX has an A+ rating from the BBB, and is one of just a handful of places that is able to buy certain commodities directly from the US Mint. If you ask me, that is two pretty big check marks for the company. APMEX has customer service representatives available 24/7, and they are also able to process gold coins orders around the clock. If you are looking to purchase some gold bullion / gold coins, then I would definitely suggest APMEX, as they will suit your needs. All of their shipments are fully insured.